Open daily at the 2010 Stampede on Saddledome Lane, between the Pengrowth Saddledome and the Agriculture Building, Draft Horse Town features the “gentle giants” of the equine world — Belgians, Clydesdales, Percherons, and Shires — in all their majesty. Draft Horse Town offers Stampede visitors a slice of living history, plenty of hands-on activities and exhibits, and a close-up look at these magnificent beasts in action. “Generally speaking, the public’s perception of draft horses is limited to Budweiser wagons and farm ploughs, but the reality is that they’ve done so much more,” says Dale Befus, a member of the Draft Horse Town council. From July 9 to 18, visitors can help wheelwrights build wood-spoked wheels, observe blacksmiths shoeing horses and forging other items, enjoy live Western music, and take in a draft horse art exhibit. 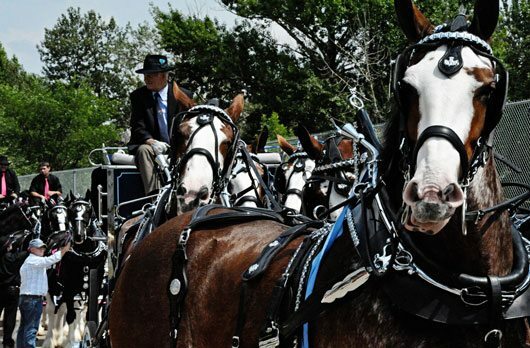 Teamsters and exhibitors will demonstrate how they prepare their teams for competitions such as the Heavy Horse Show, which runs from July 9 to 12 at the Saddledome, and the Heavy Horse Pull, which goes from July 16 to 18 under the Big Top. Test your own “horsepower” with the Incredi-pull, cool off under the spray of the pump wagon, and watch as a draft horse operates an ice-cream maker with a treadmill for a sweet treat. Climb up on a carriage, have your picture taken with one of these gentle giants, and make sure to visit the Heavy Horse Barns to meet these brawny beasts who’ve been known to tip the scales at 2,600 pounds. “We wanted to make sure this was not a museum exhibit. We wanted to give people an authentic experience, and make it much more of a participatory event,” says Tim Lane, who’s also on the Draft Horse Town council. Draft Horse Town exhibitors include the Military Museums, the Remington Carriage Museum, the Heavy Construction and Road Builders Historical Society of Canada, the Firefighters’ Museum, and the Bar U Ranch of Longview, Alta., which is credited with restocking Europe’s Percherons following the First World War.